Preserve Samsung Galaxy S5 battery life with power saving and ultra power saving modes. What is this feature and how does it work on the device? Power saving mode helps reduce battery usage, thus extending battery life on your device. 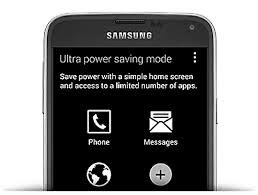 This article will walk you through the settings configuration of ultra power saving mode on Samsung Galaxy S5. Read on to learn more. This feature does not come on automatically so you have to configure it manually. There are two ways to enable power saving and ultra power saving modes on the Galaxy S5. Read on to learn these methods. 1. Use your two fingers to pull down the status bar from the top of the device's screen. 2. Touch Power Saving to continue. If power Saving mode is turned on or enabled on your phone, it will limit the device's functions to save battery power. 2. Touch Settings to proceed. 3. Touch Power Saving Mode. 4. Touch Power Saving mode option under Power Saving menu. 5. Toggle the Power saving mode switch to the right. This will enable the feature on your phone. When Power Saving mode is activated, the phone's performance, background data and device color are constrained. Block background data - This option lets you set the phone to prevent apps that are running in the background from utilizing a mobile data connection. Restrict performance - This option lets you set the phone to limit resources, including display brightness reduction or turning of vibration when keys are touched. Grey scale mode - This option lets you set the device to display all colors. If you want to extend standby time and reduce battery consumption on your Galaxy S5, then enable ultra power saving mode on the phone. 1. Use two fingers to pull down the status bar from the top of the screen. 2. Touch Ultra Power Saving. 3. You will be prompted with an information popup for Ultra Power saving mode with current battery percentage and estimated max standby time. Just tap OK to confirm action. Screen colors are displayed as grey tones. Access to default apps and to many other apps that can be select from the list will be limited. Wi-Fi and Bluetooth features are deactivated. The estimated battery running time and remaining battery power will be displayed on the bottom screen. The estimated max standby time displays the estimated amount of time remaining while the device is not in use before the battery power runs out. 2. Touch Settings to continue. 3. Touch the Power saving mode icon. 4. Touch Ultra Power saving mode option under Power saving screen. 5. Toggle the Ultra Power Saving mode switch to the right. Doing so will enable the feature. 6. You will be prompted with the information popup for Ultra Power Saving mode. Tap on OK to confirm action. A new popup for enabling ultra power saving mode will appear. Now that Ultra Power saving mode is enabled, you should see the remaining battery power and estimated battery running time on the bottom screen of your phone. 1. Tap Disable Ultra Power saving mode. 2. Touch OK to confirm action. A popup for disabling Ultra Power saving mode will appear and then device should now return to normal mode.